The indie market is absolutely overwhelming for me. I feel like it's just nail polish overload on social media with all the indies out there. I cannot keep up especially now with so many small releases, specialty collection, indie boxes. Literally, my brain cannot compute. It's just too much. I really try zone in one brands I love and honestly I have to tune the rest out. Every so often, a brand pops on my radar and I have a new much loved brand. That brand for me now is Noodles Nail Polish. I came across their holiday collection and fell in love. I then came across their winter collection and fell harder. This was one of the colors I feel for. Winter Dazes is a deep cornflower blue crelly that's full of gold holo glitters, blue/gold flakies, and aqua micro glitter. Color: You know me. I love my cool-toned colors paired with warm metals. 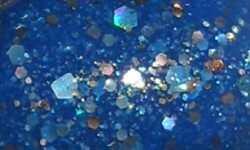 I love this shade of blue paired this mix of glitters. It's gorgeous and unique. I adore it when indie makers do color combinations like this, they're my absolute favorite. Formula: Excellent formula. I used 2 coats above. This applies beautifully, smoothly, and opaquely. Price: This is $8.50 on Noodles Nail Polish etsy site. This one is limited edition! There are only 8 bottles left! Get one! Overall: This is an all star polish. I love the color combination. The formula is excellent and probably one of the best crelly formulas I've tried. I think this is must have, so for the 8 of you left who get it you're lucky!